MANILA, Philippines - The results and list of passers of the April 2018 Registered Electrical Engineer (REE) and Registered Master Electrician (RME) board exams including the top 10 examinees, top performing schools and related announcements are available at this website as the Professional Regulation Commission (PRC) officially released the results online three (3) working days after the last day of board examinations. As announced, 1,315 out of 2,523 Registered Electrical Engineers and 1,831 out of 3,656 Registered Master Electricians successfully passed the EE board exams. The April 2018 Electrical Engineer licensure exams are administered by PRC Board of Electrical Engineering headed by its Chairman, Engr. Francis V. Mapile and Engr. Jaime V. Mendoza, Member on April 17-18, 2018 (REE) and April 19, 2018 (RME) at PRC testing centers in Manila, Baguio, Cagayan de Oro, Cebu, Davao, Iloilo, Legazpi, Lucena and Tacloban. The schedule of online appointment for issuance of Professional ID and Certificate of Registration will be from April 30 to May 9, 2018. As per Resolution No. 2017-1068 entitled "Schedule of Licensure Examination for Year 2018", the target release of April 2018 REE and RME board exam result will be on April 24, 2018 (Tuesday) or three (3) working days after the last day of exams. However, the above-mentioned date is not final as PRC may also release the ECE official results earlier or later than the stipulated date without prior notice. Just keep tuning-in at at this article for timely updates. On the same exams conducted by PRC on September 2017, April 2017, April 2016 and September 2016, results were out after three (3) working days. The April 2018 Registered Electrical Engineer (REE) board exam covered topics from Mathematics (Algebra, Trigonometry, Analytic Geometry, Differential Calculus, Integral Calculus, Complex Numbers and Space Vectors, Probability and Statistics, Matrices and Determinants, Sequences and Series, Other Engineering Mathematics such as Differential Equations, Fourier Series, Laplace Transforms, and others) - 25%; Engineering Sciences and Allied Subjects (General Chemistry, College Physics, Engineering Materials, Engineering Mechanics, Thermodynamics, Fluid Mechanics, Engineering Economics and Management, Electrical Engineering Law and Code of Ethics, Contracts and Specifications, Computer Fundamentals and Programming, Philippine Electrical Code, Parts 1 & 2 and others) - 30%; and Electrical Engineering Professional Subjects (Quantities/units/constants, Electrical Materials, Passive Circuit Elements, Active Circuits Elements, AC Impedance, Instruments and Measurements, DC Electric Circuits, Transient Response, Magnetic Circuits, AC Electric Circuits, AC Generators, DC Generators, Energy Sources, Energy Conversion, Prime Movers, Rotating Electric Machinery, Power System Components, AC Transmission, DC Transmission, Power System Interconnection, Substation Design, Power Distribution, Wiring Design for Buildings, Power Electronics, Industrial Electronics, Illumination, Telecommunications, Computer Application in Electrical Power Industry and others) - 45%. Meanwhile, April 2018 Registered Master Electrician (RME) board exam covered topics from Technical Subjects (Basic Electricity, RA 7920, Tools, Test Equipment, Electrical Measurements, Lighting, Wirings and Materials, Fuses, Breakers, Switches, Motors, Starters, Generators, Transformers, Operation, Working Principles, Maintenance, Transmission and Distribution Lines, Substation, Ohm's Law and others) - 50%; and Philippine Electrical Code Parts 1 & 2 (General Installation Requirements, Wiring Methods and Materials, Wiring Devices, Tools and Techniques, Wiring Ampacity and Protection, Equipment for General Use, Special Occupancies, Special Equipment, Special Conditions, Lighting and Wiring, Motor and Generator Wiring Connections, Communications and Signaling Wiring, Electrical Safety and others) - 50%. Electrical Engineering is one of the programs with average number of examinees being administered by PRC. On the most recent board exams conducted September 2017, 2,807 out of 4,460 Registered Electrical Engineers and 2,643 out of 3,864 Registered Master Electricians successfully passed. Edilbert Vallecera Tandaan from Camarines Sur Polytechnic College - Nabua topped the REE exams garnering 91.80% rating followed by Ronel Del Rosario Mananap from University of Batangas having 91.70%. Complete list of topnotchers for September 2017 REE are posted here. Clint Kenneth Untayao Reducto from Capiz State University - Main Campus ranked first in the RME board exams having 93.00% followed by Jenneth Macabante Madrid from University of Perpetual Help System Dalta - Las Piñas having 92.50%. Complete list of topnotchers for September 2017 RME are posted here. In the top performing schools category, University of Santo Tomas topped the schools in REE having 74 out of 75 examinees passed or 98.67% overall passing rate. In RME, Polytechnic University of Philippines - Sto. Tomas ranked first having 58 out of 59 examinees passed or 98.31% rating. Complete list of schools' performance are posted here. During April 2017 Electrical Engineer board exam, 994 out of 2,213 Registered Electrical Engineers and 1,817 out of 3,130 Registered Master Electricians successfully passed. Batangas State University - Batangas City topped the REE board exam having 68 out of 77 examinees passed or an overall passing rate of 88.31%. In Registered Master Electrician RME, De La Salle University-Lipa ranked first in the top performing schools having all of its 69 examinees passed or an equivalent 100% passing rate. Complete list of schools' performance are posted here. Kent Meyler Malones Samaranos from Mindanao State University - General Santos City topped the REE having 90.90% rating while Cedie Orain Pamplona from Bicol University-Legazpi ranked first in RME garnering 94.00% rating. Complete list of topnotchers here. On September 2016 of the same exams, 2,817 out of 4,115 Registered Electrical Engineers and 2,525 out of 3,709 Registered Master Electricians successfully passed. University of Santo Tomas ranked first in the REE top performing schools having 65 out of 66 examinees passed or 98.48% passing rate while Technological University of the Philippines - Manila topped the RME having 61 out of 70 examinees passed or 87.14%. Complete list of schools' performance here. Alfred Isaac Rondina Ajo from Cebu Institute of Technology topped the REE exams garnering 92.40% while Aidan Destacamento Encarnacion from Sorsogon State College Sorsogon, Judy Ann Perez Montecillo from Laguna State Polytechnic University - San Pablo and Alexander Tumbaga Zurbito Jr. from Bicol University - Legazpi topped the RME having 93.00% rating. Complete list of topnotchers here. 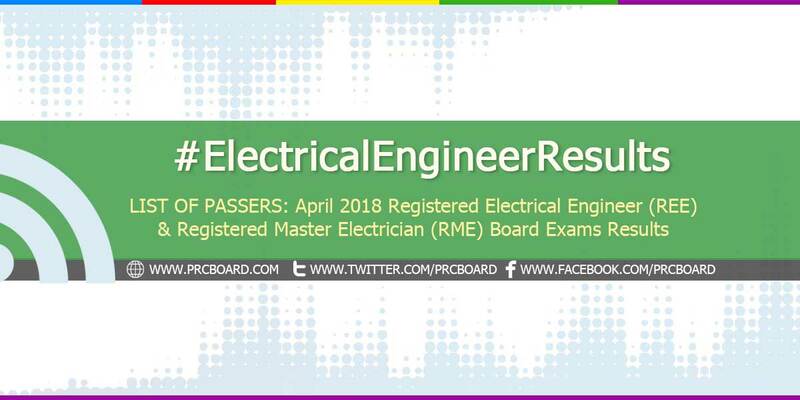 To receive up-to-date news about April 2018 Registered Electrical Engineer (REE) and Registered Master Electrician (RME) board exam results, we advise our visitors to bookmark this page, visit PRC official website or follow us at our social media pages via Facebook and Twitter. anong oras kaya e rerelease? Results are expected anytime within today. Good luck everyone! Good things happen to those patiently waiting. tawagan PRC para ma release na. wag mong salubungin. dadating at dadating din yan!